Warning! Some parts of this kit operate at lethal MAINS VOLTAGES. This kit is supplied tested and working but MUST be installed in an insulated (plastic) box before it is safe for use. We will not be held responsible for compliance with appliance standards or safety standards in your local area. Super-PID requires a router that does not have an internal speed control or that has an internal speed control with a "click" type bypass switch at the full speed setting. If you are unsure ask about your router model? . Routers that have an internal speed control (or soft-start feature) can usually by bypassed relatively easy by joining the all 3 pins/legs of the router's internal TRIAC device. This is reversible and should not hurt the router but may void the router warranty and should only be done by someone skilled in appliance repair. Contact us for photo guides of the router mod for your router. Will Super-PID work with my router? Super-PID is compatible with most router motors/spindles on the market that have an universal AC motor, the type that has brushes (like any typical router) which are normally air cooled with an internal fan. What router should I use with my CNC machine? Router model choice (or more importantly router size) would depend on your requirements; level of usage (professional continuous use or hobby occasional use), the material that you intend to mill, and your budget etc. The most popular router brands used with Super-PID are; Bosch, Porter Cable, Hitachi and DeWalt. We encourage you to discuss with other experienced users for individual router performance and usage feedback. The CNCZone Forum and the Router Forums contain many such experts, or try a Google search for router reviews. I have an unusual application, will Super-PID suit my requirements? Can Super-PID make my small router motor cut better with more motor torque? Yes, many Super-PID users have successfully used small hand held router motors such as Dremel. Why buy Super-PID instead of a basic cheap ebay router speed controller? Super-PID utilises a proprietary closed-loop sensor feedback system to give high cutting power at much lower RPMs while maintaining the exact router RPM speed. 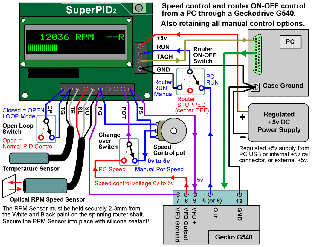 Super-PID can also be controlled via CNC Control software such as Mach3, Mach4, EMC2/Linux CNC, etc. Enabling your PC software to set the router speed, and to control the router motor on/off. Do I need to modify my router to work with Super-PID? Yes -- Routers with an internal speed control and/or a soft-start feature must be modified to work with Super-PID. This involves removing the router cover and removing/disabling the router internal electronics. We are available for tech support with this router mod. It is a simple and usually reversible modification to your router. Contact us for photo guides of the router mod for your router. No -- Routers without internal speed control (or routers with speed control and a click-dial-switch to select constant full speed) should not need modification. Note! : Routers with a soft-start feature will require modification. If you are unsure ask about your router model? . Why do I need to modify my router to work with Super-PID? Super-PID replaces the router's basic internal speed control device. You cannot have both trying to control your router speed. Super-PID provides an advanced speed control and has it's own soft start feature to protect the router at startup. Are photos guides available to show how to modify my router? Yes, photo guides are available for the most common router models. Please email us with your router make and model. 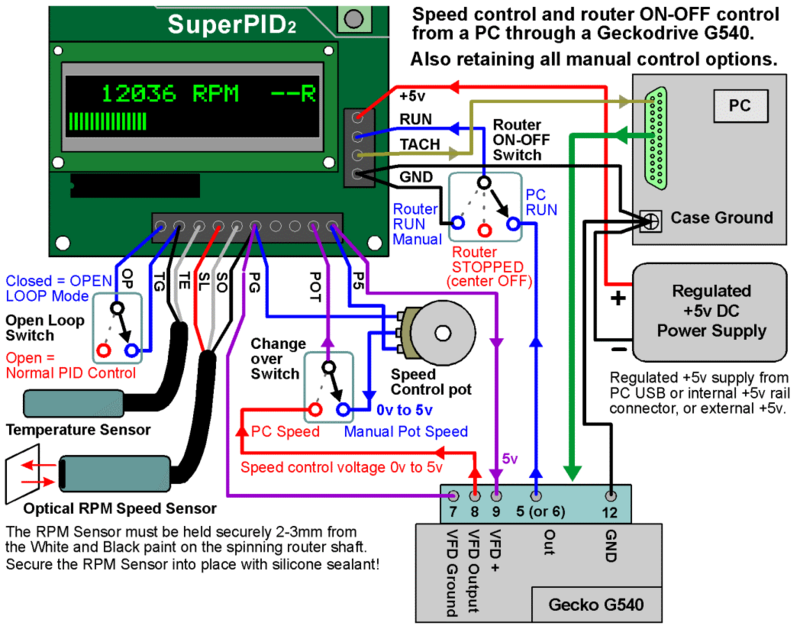 Will Super-PID work with the Gecko Stepper Driver on my CNC machine? Yes -- Super-PID is compatible with the Gecko CNC control products, a common CNC machine driver and breakout board combined. 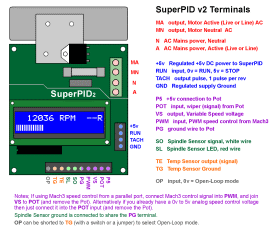 For connecting the Gecko G540 to Super-PID please refer to Page 25 of the SuperPID-v2 Instructions. The wiring diagram below shows all possible connections from Super-PID to the Gecko G540. This enables router speed control and router ON/OFF control from PC software, through a Geckodrive G540 (or any other BreakOut Board). The wiring diagram also shows how to retain all the manual/hand control options, and easily switch to PC control when desired. I do not use a Gecko board, will Super-PID work with my CNC BreakOut Board (BOB)? Yes -- Super-PID is compatible with all the standard CNC controller breakout boards. 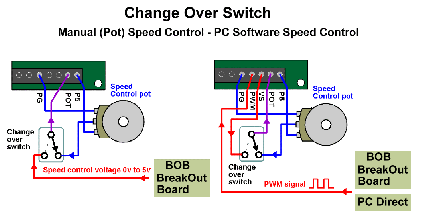 The breakout board is the communication link between the computer software control and the CNC machine drivers. Please refer to Page 24 of SuperPID-v2 Instructions. 1. Router ON/OFF - RUN signal wire (logic level): Zero volts=RUN. 5volts=STOP. 2. Router speed control - Speed control analog voltage: 0volts=5000 RPM. 5volts=30000 RPM. or PWM logic level PWM signal: 0% PWM=5000 RPM. 100% PWM=30000 RPM. I use CNC control Software on my PC to control my CNC machine, does this work with Super-PID? Yes, Super-PID is compatible with all the common CNC control software available, including; Mach4, Mach3, EMC2/LinuxCNC. Please refer to Page 26 of SuperPID-v2 Instructions for setting up the PC CNC control software for router speed control. Also refer to your CNC Control Software Instructions for details specific to your software. Which Super-PID Firmware do I need? Every Super-PID v2 includes both Firmware options. We recommend that you select the Firmware setting to suit how you will MOST OFTEN control the router speed on your CNC. Either by manual/hand speed control using the supplied speed control pot, or by using PC CNC Control Software (such as Mach4, Mach3, EMC2/LinuxCNC etc) to control the spindle speed. How do I change the Firmware setting? The Firmware setting can be changed if needed when you change your machine control preference. 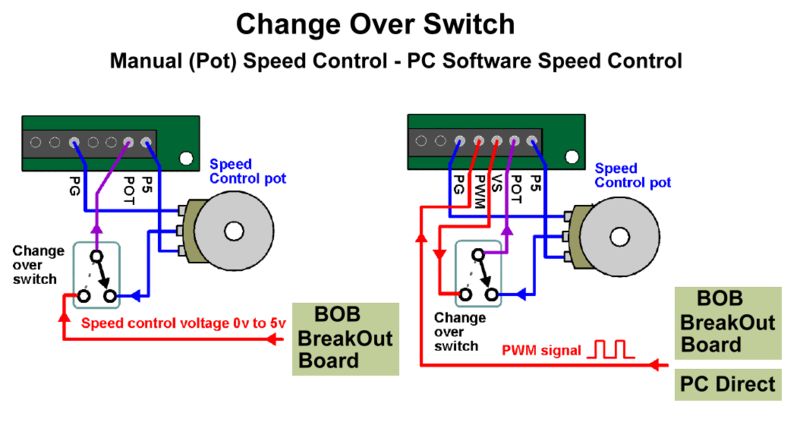 From the standard manual pot speed control (using the SuperPID LCD display for the RPM setting), or PC software speed control. 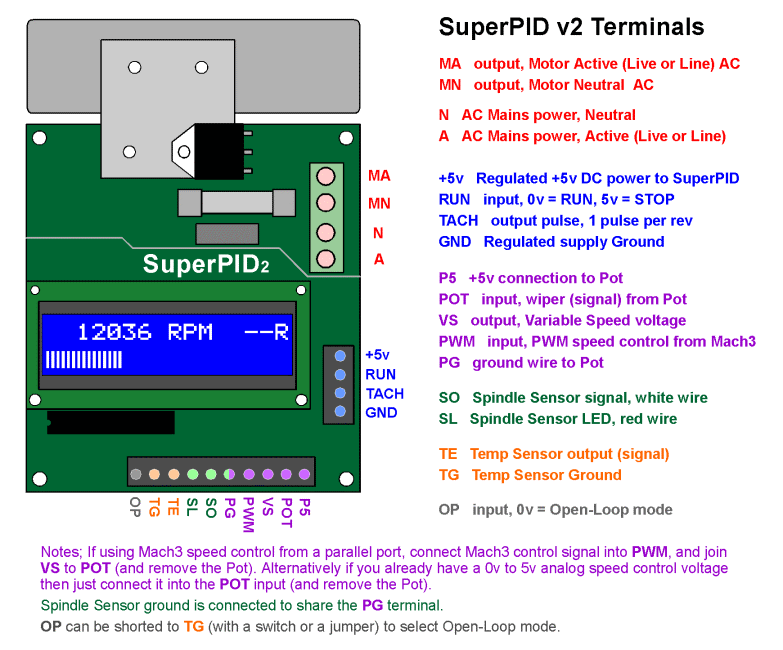 Please refer to Page 21 of SuperPID-v2 Instructions for further details on the Speed Control Firmware options. If you only occassionally use manual speed control, we recommend that you leave your Firmware set for PC software speed control and use a change over switch for switching between manual knob speed control and PC speed control. Super-PID is designed and made in Australia, to high quality controlled standards. How long to process my Super-PID order? Most orders are shipped within 2 to 16 days of your order being received. This allows enough time for us to complete the manufacture of your order and any customisation you request. How long to deliver my Super-PID order? Airmail delivery from Australia usually takes 9 to 16 business days, some countries may take slightly longer. Express Courier (EMS) delivery typically takes 4 to 10 business days, again slightly longer to some countries. Registered Post, or EMS, is recommended for some countries. Shipping upgrades are available from within the shopping cart. What is the shipping cost to my location? The shopping cart will automatically calculate the shipping cost. After you add to cart your desired items, please select your location (drop-down list) then hit recalculate. Shipping cost is calculated on the total order weight; 250g, 500g, 750g, 1kg etc. For example one Super-PID and some additional accessories will fit into the 500 gram weight bracket. For a very small order size (under 100g) we will refund the excess shipping paid. I do not have PayPal, can I order another way? Yes, other payment options include; credit card, T/T funds transfer, payment in $AUD. Please contact us for details. I need a pdf order receipt for my business records? Sure, please contact us and we can email your invoice as .pdf format. I want to change my order and add something? OK, please contact us ASAP and we can change your order, provided it has not yet shipped. Yes, if you are not entirely happy with the product once you receive it we do offer full refund of your purchase price, less shipping costs. This 60 day refund will be processed to your PayPal account or credit card once we receive all the returned items in un-used, undamaged condition. Every Super-PID unit is thoroughly completed (to your order requirements) and tested prior to shipping. Then sealed, wrapped and protected in sturdy shipping box. Every care is taken to ensure the protection and intregrity of your product during shipping, and we will not be held responsible for damage in transit. If you do find a problem with your order please contact us immediately with a full description, and we will work with you to help resolve any problems promptly. Yes, we have security procedures to protect the security and privacy of your personal information, and we also offer PayPal ordering for your protection. Please refer to PayPal Security and Privacy Policies for further details of how PayPal protects you. Your personal information (name, address and email) will only be used for processing and shipping your order, order confirmation, and tech support. You are welcome to email us anytime. Please help my emails are not getting through, not being answered? Resend your email with a second (or third) email address and a phone number for us to contact you. Please note! If you have an @comcast.net email address, always include a second email address and phone number for us to reach you. Sometimes our emails responses to comcast.net do not always get through. Please also check your "spam" folder or "trash" folder incase our emails to you were deleted by the spam filter. We only email you to respond to your questions, such as tech support or ordering, or set-up for your CNC machine and router. When you complete your order, one 'order received' email will automatically be sent to your email address (which you provide with your order). After your order is sent, a 'shipping notification' email with parcel tracking details etc. If you do not receive either of these two ordering emails please let us know and include a second email address (not comcast email). Note! : These instructions only for the original Super-PID v1. The current version Super-PID v2 download is at top of page.